Weight: 8 lbs, 12 oz. Height: 23 inches, everyone comments how long he looks! Clothes: All newborn! We actually had to go out and buy more newborn clothes and sleepers because I wasn't sure how long he would be in them, but I think we've still got another week or two left in them! Diapers: Newborn. 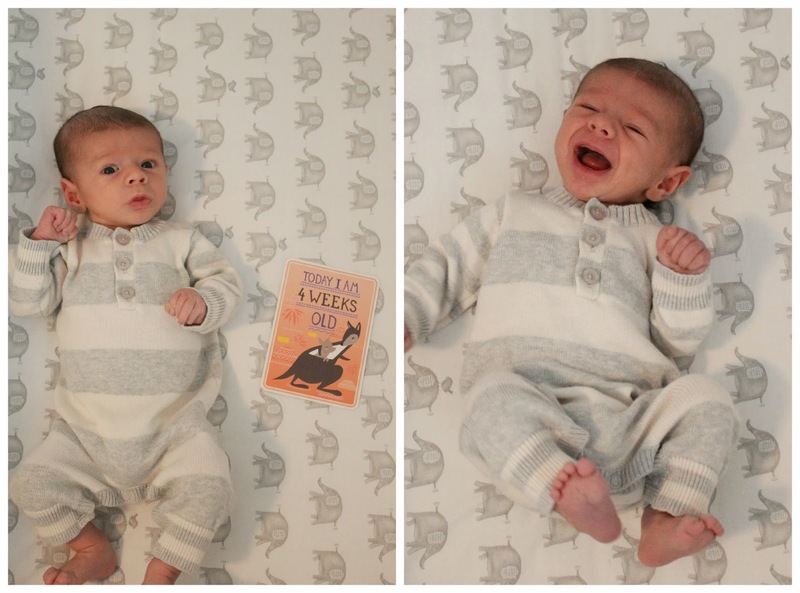 We have only tried Pampers Swaddlers, but that's because we love them and he seems to as well! No diaper rash so far and very minimal leaks, so we are sticking with them for now. Sleeping: Since I'm breastfeeding, we were waking to feed him every 3 hours in the middle of the night before but since he's gained enough weight he is now giving us a few 4 hour stretches every night (and one 5 hour). This past weekend he only woke up once, which was awesome! Also, lately he's done really great at going right back to sleep after feedings in the middle of the night. This little peanut, though, refused naps during the day a lot last week. I think it was because he had a growth spurt and was wanting to eat more, too! Likes: Being held and rocked to sleep, mornings (so alert and smiles a ton! ), Sophie "Colors" book (he makes the funniest facial expressions when I read this to him and show him the pages), he will take a paci but only half the time, baths (he HATED them at first, but seems to enjoy them now thanks to putting a warm washcloth over him and using a space heater to keep the room warm! ), looking outside, and dun dun dun...the bathroom fan, haha. Eating: Exclusively breastfed/bottle fed every 3 hours (like clockwork!). Sometimes, especially during a growth spurt like last week, he will eat every 2 hours but mainly it's every 3 hours during the day with longer stretches at night. I have been breastfeeding during the day and Billy will bottle feed him at night while I pump. Milestones: Cam is such a strong little dude! He holds his head up all the time and our pediatrician comments about it every time we come in. He has the strongest little legs, too! He started smiling the past few days which we LOVE!! Everyday just gets better and better with him. He used to hate being on his back and being changed, but he rarely cries when being changed now which makes us so happy! Mommy's Favorites (aka things that keep me sane): Sleep Sheep (#LIFESAVER, specifically the Ocean sound), Rock n Play, Aden and Anais Swaddle blankets, our BOB stroller (even though it's winter we've got out for a few walks when it's on the warmer side and I just love it! I can't wait to run with him! ), SwaddleMe, Wubbanub's, Musical Seahorse toy, cuddles, and Solly Baby Wrap. But for real, HOW IS OUR BABY 1 MONTH OLD ALREADY?! This month was filled with the lowest of low's and the highest of high's. It's gone from the best day of our life...to past the point of exhaustion...to extreme sleep deprivation...to learning to adjust to the little sleep...to having extremely challenging days...to needed breaks out of the house...to missing him when leaving the house (funny how that works)...to now feeling way more comfortable/confident as first time parents, happy with the little routine we have going on, and wondering how we EVER lived without him. In simple terms-this means that he has a floppy, soft cartilage which causes partial airway obstruction. It is often worse when Cam, or the infant, is on his or her back because the floppy tissues can fall over the airway opening more easily in this position. Basically, he just sounds a little squeaky at night. When he sleeps during the day it's not as noticeable. Luckily, this is something that he will just grow out of (8-10 months on average) and his is more on the mild side! As you can imagine though, this doesn't ease our minds all the time as we are often worried about his breathing. I will say that the Snuza (alarm that clips on his diaper) has helped us get some sleep and some days we notice his breathing is much better. He also has acid reflux, unfortunately, and is on Prevacid (which seems to really be helping! ), so both of these things made the first two weeks extremely stressful and hard. This little boy has stolen our hearts in every single way possible. I don't go 5 minutes without kissing him or thanking God that he is ours! I know that I'm biased but he is honestly the cutest little boy in the world. He has the prettiest eyes and his lips and forehead wrinkles are adorable. We love you, Cam, and are so extremely proud to be your parents! You give our days, and our life, a whole new meaning. He's absolutely adorable! I love his little outfit in the first picture! Adorable! I can't believe he's a month old already!! Ps- I'd stick with pampers. We've tried Huggins and Costco brand --- leaked every time he peed. I've had a lot of other moms say the same thing too. He is just so cute! I'm so glad to hear he's doing better! He is just the cutest! And we had to go buy more newborn clothes too because we thought Aiden would be bigger! Glad you're feeling better about the ENT visits. Our doctor, Dr. Lind at NCH was awesome! And the prescription healed up all the reflux without any side effects. You will be out of he woods before you know it! 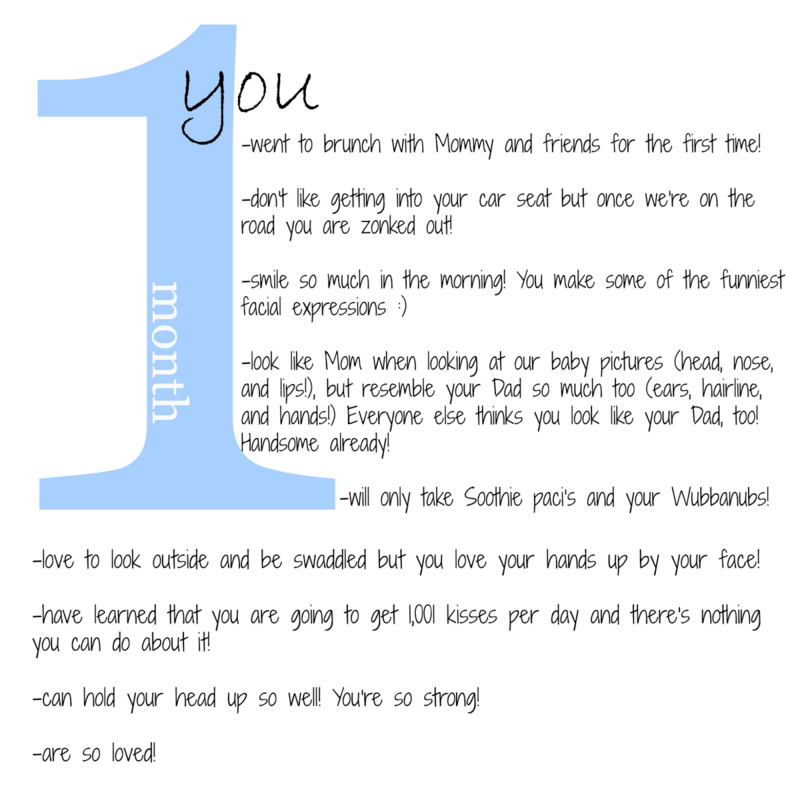 You got through the first month (praise hands!)!! Seriously was the most challenging month of my life, but also the most wonderful and rewarding. That must have been so scary taking him to Children's when he was brand new! I'm so glad it's something he will outgrow in time. He is just the cutest and really is a replica of both of you! Enjoy those baby snuggles!! congrats on surviving the first month- it keeps getting better. My daughter had moderate reflux and I will tell you this- have them sleep at incline- so the rock n play and swing are awesome! I know people tell you not to let them nap in a swing BUT for reflux babies, sleeping at an incline is a must.We did all naps in the mamaroo for the first 2 months and night sleeping in the rock n play until almost 5 months. Once the reflux started to improve, we started doing some naps in her crib to get her used to it. She transitioned great into her crib and loves it. Love this! How has it been a month already?! He's so handsome! :) I'd love to hear why you chose the Snuza. I've looked into a few of the baby sleeping monitors and lean towards the one that goes on their foot. Camden is entirely precious, and I'm so happy for y'all! Feel free to post any "new mommy" tips on the blog! I will be a first time mommy, too, so any help / advice you can give, I'm all ears! ESPECIALLY about breast feeding....eeeek! So nervous!